"If Iran's rulers were truthful about the animosity they claim to feel toward the Great Satan, they would never have provided support for its occupations. 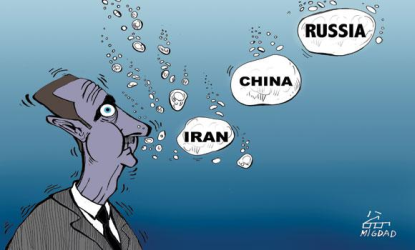 ... More evidence of Persia's avarice regarding our Arab world emerged a few days ago, when it came out that Iran considers Syria an Iranian province. ... Iran's 'support' for the resistance is based on interests that are purely Iranian. It has nothing to do with love for the resistance, and everything to do with achieving its expansionist aims, which Assad's fall would imperil." Mehdi Taeb, a close confidant of Supreme Leader Ayatollah Seyyed Ali Khamenei was quoted as saying last week that Syria is Iran's '35th province.' Is Iran pretending to be a friend to Arabs in order to more effectively dominate the region? Congratulations Arabs. After decades of independence, thanks to the folly of our rulers and the plotting of others, we find ourselves under the hammer of a new colonialism represented by the Persian ghoul. Amazingly, under the banner of religion, it is doing the impossible: restoring the glory of the Persian Empire. Its path is a fabricated hostility toward the Great Satan (America), and virtual hostility with the Zionist entity. And its passport to infiltrating our Arab world was the closure if the Israeli Embassy in Tehran and its replacement with the embassy of Palestine. In the beginning of what is known as the Iranian Revolution and in the name of the resistance launched by the Iranian leadership, many sons of Arabism swallowed the Persian bait, and aided Iran's organization of control and hegemony over our Arab world. They proclaimed that the road to Jerusalem led through Baghdad as if Baghdad were like Washington in its support of the Zionist entity and animosity toward the Arab nation. Since 1979, what have the Persians ever done to help Palestine and support the opposition and resistance in our Arab world? Let us answer the questions many people are asking with facts clear enough for anyone willing to hear. Those who are blind to the truth are either participating in the Iranian scheme or are receiving short-term benefits they will little time to enjoy. If Tehran's rulers were honest about wanting to stand with Arabs to reclaim their rights, they would have returned the Arab lands they have taken by force. The Arab Ahvaz is still under their control and they oppress the people there day and night. And they would have returned occupied Arab lands that comprise an area many times larger than that occupied by the Zionists. If the rulers of Persia were honest about standing against the Zionists, they wouldn't have relied on them during their war against Iraq. The on July 18, 1981 crash of an Argentine aircraft in the former Soviet Union loaded with Zionist weapons for Tehran is proof of defense cooperation between Iranian and Israeli rulers, and exposes the lie of their hostility toward the Zionist entity. If Tehran's rulers were truthful about the animosity they claim to feel toward the Great Satan, they would never have provided support for the occupations of Afghanistan and Iraq. Former Iran Vice President Mohammad-Ali Abtahi has said quite plainly that if it wasn't for us Iran, America would not have been able to occupy the countries. And conversely, the Americans, even as they were present in the country and after their supposed withdrawal, would never have allowed the mullahs of Qom and Tehran to control Iraq politically, economically and in terms of security. If Iran was really truthful about its support for the Arabs and their causes, it would stop claiming Bahrain as an Iranian province, and they would stop appointing a Bahrain "representative" to the Majlis [Parliament]. Fans of Iran might argue that the Iranian-backed resistance and opposition supports Hezbullah, and see in this an example of the Qom and Tehran mullahs standing on the side of Arab rights. Our answer is that that Hezbullah is part and parcel of Iran's system of hegemony over Arab countries. The idea of launching it was Iran's, its charter was written in Tehran, and its activities are executed through the Iranian leadership. Furthermore, all of the acrobatic operations Hezbullah has executed against the Zionist entity are part of a previously agreed-upon Persian-Zionist scheme. Further evidence of Persia's avarice regarding our Arab world emerged a few days ago, when it came out that Iran considers Syria an Iranian province. 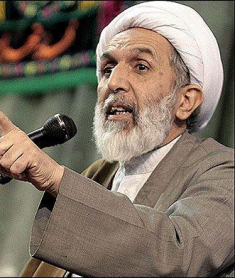 Mehdi Taeb, a member of the supreme leader's inner circle and head of an organization fighting a "soft war," was quoted telling student members of the Basij militia, "Syria is the 35th province [of Iran] and a strategic province for us. If the enemy attacks and wants to appropriate either Syria or Khuzestan Province [western Iran], the priority is that we keep Syria ... If we keep Syria, we can get Khuzestan back too; but if we lose Syria, we cannot keep Tehran. That is the truth of Iranian support for the Arabs. It is "support" is based on interests that, far from being Arab, are purely Iranian. That explains why Tehran supports the Assad regime over the legal rights of the oppressed Syrian people. Tehran considers the potential fall of the Syrian regime to be synonymous with the fall of the Persian project in the region. Its support for the resistance has nothing to do with love for the opposition, and everything to do with achieving its expansionist aims in the region, which would be imperiled by the Syrian regime's fall.